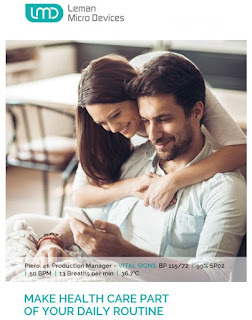 Vital signs are important indicators of health, and are useful in assessing the general physical health of a person, give clues to possible diseases, and show progress toward recovery. While most of us have had them measured at the doctor’s office, some are dependent on measuring their vital signs far more often than in an annual checkup. They can not only detect early signs of underlying health issues, but for example help doctors monitor treatment efficacy. As a result, we have seen increased focus on developing technologies that help measure vital signs outside the doctor’s office and emergency settings. The Swiss startup Leman Micro Devices is empowering consumers to monitor their health using their smartphone to take medically-accurate measurements of their vital signs. They are developing an inexpensive, miniature sensor, called V-sensor, which is built into the top edge of any smartphone. 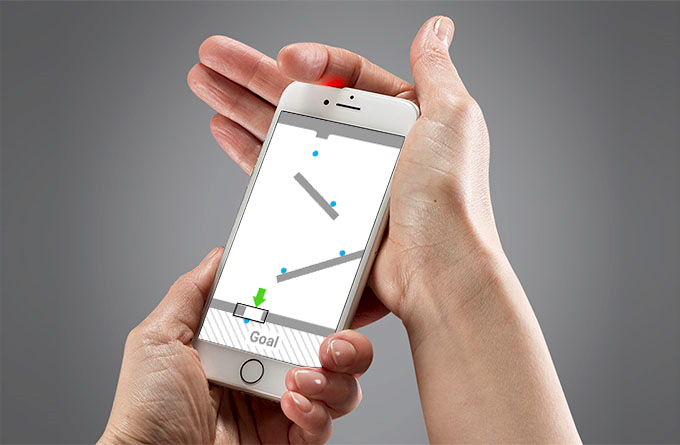 The technology is based on the well-proven Riva-Rocci technique to measure blood pressure, but instead of using a cuff around the arm, the inside of the index finger is pressed onto the sensor on the smartphone. A complementary, factory-loaded app with a basic game function ensure that the user maintains the correct pressure to enable values of systolic and diastolic pressure to be computed. In addition, the sensor give accurate readings of body temperature, blood oxygen saturation, heart rate and respiration rate. By following simple instructions, all five measurements are performed anywhere at any time in under 60 seconds, without any extra accessories. The data is displayed through the app, stored, and can be shared with your doctor. The startup is specifically targeting hypertension, one of the world’s most neglected killers, affecting a quarter of the adult population. It is easily treated if you know you’ve got it, either through lifestyle interventions or medications, but current products for home use that measure and monitor blood pressure and other vital signs are often inaccurate and unreliable. Leman Micro Devices is developing unique sensors that accurately and reliably measure five vital signs, including blood pressure, costing less than $5 dollars. It has wide application, and can be used as part of a daily routine for people who want to live a healthy lifestyle, or can be used by patients to closely monitor treatment efficacy and recovery. The platform engage patients, while making the communication with doctors more efficient. Results of measurements can be shared safely, and doctors can quickly intervene if necessary, helping them reallocate resources to where they are needed the most. It can reduce unnecessary doctor visits, hospital admissions and readmissions, potentially reducing healthcare costs. Most importantly, the technology could revolutionize public health and preventive care. Through smartphones, Leman Micro Devices can deliver a powerful health monitoring-system to all corners of the world, potentially saving millions of lives. It could increase access to care in rural and low-resource settings, improving health outcomes regardless of where you live in the world, democratizing healthcare. Leman Micro Devices is starting trials to obtain CE, FDA and other medical approvals around the world, and expect to submit the sensor and app for full approval and certification later in 2017. They want to license the technology to major smartphone companies to integrate the sensors into their phones within a few years. The startup has offices in the EPFL Innovation Park, and is funded by business angels, venture capital and major players in the smartphone sector, including Start Angels Network, Zühlke Ventures, Heptagon and SamsungElectronics.